Although NOArg and other NOS inhibitors clearly implied a role for nitric oxide in morphine tolerance, some observations were not easily reconciled. Given supraspinally, NOArg potentiated systemic morphine analgesia. However, spinal NOArg had the opposite effect, lowering systemic morphine analgesia in a dose-dependent manner (Fig. 2) (20). Earlier work from our laboratory had found no effect of NOArg given systemically on morphine analgesia, presumably the result of the simultaneous inhibition of the opposing spinal and supraspinal systems. How could these opposite actions between supraspinal and spinal systems be reconciled? 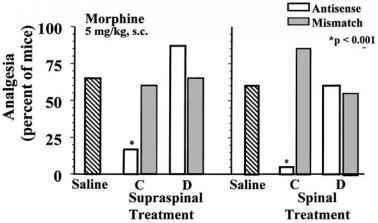 Supraspinally, NO impedes morphine analgesia, as shown by the acute effects of supraspinal NOArg and its role in inducing tolerance. Yet, at the spinal level, NO is integrally related to the production of morphine analgesia because its blockade impairs morphine's analgesic response. that lacked exons 9 and 10 (Fig. 3B). Selectively downregulating nNOS-2 proved more difficult because all of the sequences in this variant were also contained within the sequence of nNOS-1. However, we were able to accomplish this by designing a probe across the exon 8/11 splice junction. 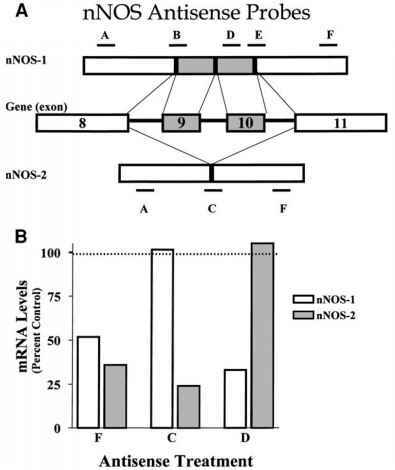 The antisense probe effectively downregulated nNOS-2, but not nNOS-1, mRNA (Fig. 3B). Presumably, the length of sequence on either side of the splice site alone capable of annealing to the antisense oligodeoxynucleotide was insufficient for activity and the probe required the full sequence, which was only available in nNOS-2. 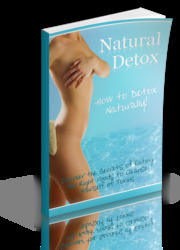 nitric oxide systems. Activation of nNOS-2 was important in producing morphine analgesia, whereas activation of nNOS-1 acted in an opposite manner by diminishing morphine's analgesic responses. Thus, the effects of NOS inhibitors such as NOArg are due to the simultaneous inactiva-tion of both systems, with the pharmacological responses dependent on the relative importance of each in the region examined. Presumably, the actions of nNOS-2 predominate spinally because the NOS inhibitor given spinally impairs morphine analgesia, whereas nNOS-1 predominates supraspinally because the NOS inhibitor given supraspinally enhances morphine responses. Fig. 6. 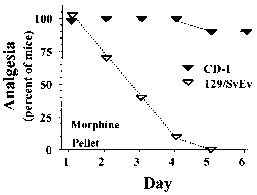 Effects of chronic morphine in CD-1 and 129/SvEv mice. 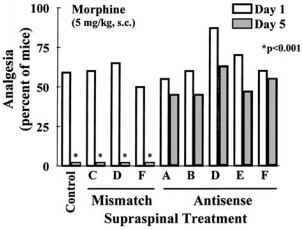 Groups of mice received morphine pellets (75 mg free base) on d 1 and analgesia was assessed at the indicated time. Results are from ref. 26. 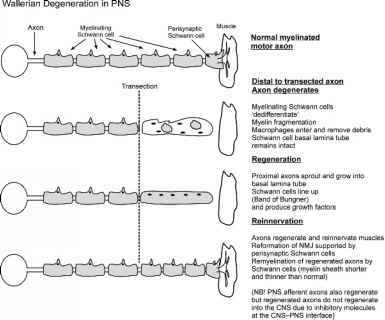 The earlier studies showed the importance of the NMDA receptor/nitric oxide synthase cascade when they were dissected pharmacologically. Recently we demonstratd that defects in this cascade occurred naturally (26), results that have since been confirmed (27). Most knockout mice strains are generated from ES cells from the 129/SvEv strain and we wanted to confirm its genetic background pharmacologically before embarking upon detailed tolerance studies in knockout mice. We were quite surprised to see that chronic administration of morphine in the 129/SvEv animals did not result in tolerance, regardless of whether morphine was given by pellet (Fig. 6), systemic injection, or supraspinally (26). Furthermore, tolerance to the 8-selective drug [D-Pen2,D-Pen5]enkephalin (DPDPE) also was lost in the 129/SvEv mice. In our earlier study, blockade of NOS prevented tolerance to morphine, but not k drugs. Similarly, 129/SvEv mice developed tolerance to the k1 agent U50, 488H and the k3 drug NalBzoH at a rate indistinguishable from the traditional strains. Thus, the 129/SvEv mice show the same pharmacological profile as previously seen with NMDA antagonists and NOS inhibitors. We then further examined the site of the defect along the NMDA/NO cascade. In CD-1 mice, NMDA given for 5 d shifted the dose-response curve fourfold. In contrast, the NMDA treatment had little demonstrable effect in the 129/SvEv mice, with only a 1.1-fold shift. We explored the actions of nitric oxide by administering l-arginine, the precursor that enhances the generation of nitric oxide. After 3 d, l-arginine shifted the morphine dose-response curve 2.7-fold to the right in the 129/SvEv mice, a response quite similar to that of the CD-1 mice (Table 2). Together, these findings imply that the nitric oxide synthase system is intact and the defect exists at either the NMDA receptor itself or a site further downstream, but before nitric oxide synthase. Thus, defects in the NMDA/NO cascade exist naturally, which raises interesting questions regarding genetic differences in the development of tolerance that may extend into the clinical arena. The NMDA receptor/nitric oxide synthase cascade has been implicated in many functions, including opioid tolerance. A variety of NMDA antagonists effectively block tolerance in animal models, including both competitive and noncompetitive antagonists and agents acting through the glycine site. Similarly, studies also have implicated the major variant of nNOS, nNOS-1, in the development of tolerance. It was interesting to find that a different nNOS variant, nNOS-2, had opposing actions.